Jamie at Home has been on my cookbook shelf for close to five years now. It moved to Seattle and back, and has survived multiple collection cullings. I can’t say I like the cover much, but it does have a nice feel to it both in texture and heft. As it should be with any book, the real joy is inside. 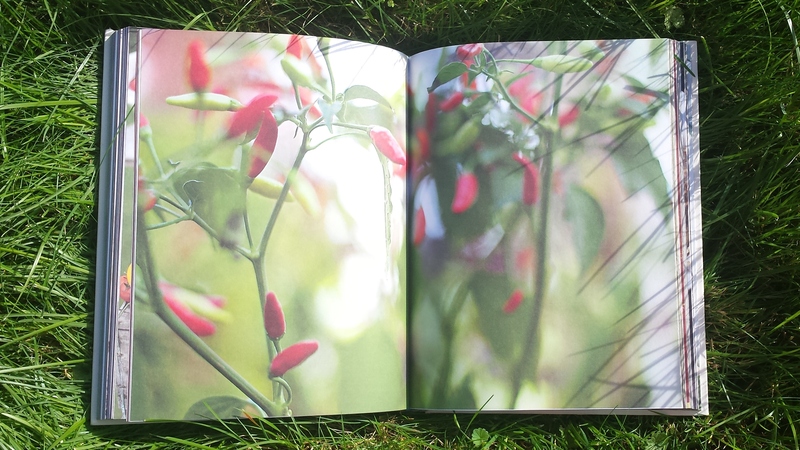 The photography is incredible, with so many garden and produce beauty shots in addition to the recipe photos. The book is arranged by season, and within each season section are chapters on specific fruit, veg, or meats available during that time (so the spring section is asparagus, eggs, lamb, and rhubarb). At the end of each chapter there are tips for growing the produce or acquiring the meat sustainably. I like that there are whole chapters focusing on humble ingredients like lettuce or onions. So many of the recipes I’ve made from this have become yearly staples, like the sweet cherry tomato and sausage bake and steak, Guinness, and cheese pie, both recipes that create almost unbelievable flavor out of very simple ingredients. The zucchini chapter has three recipes in it, and I’m sure the others are very nice but I have’t gotten around to making them since I just repeat the zucchini carbonara. Yes, bacon, egg, and cheese with pasta is a bit indulgent, but there is also a lot of squash piled in there as well. Oliver’s directions are usually a bit vague (a handful of this, pinch of that), but every time I make it I think this recipe needs a little more guidance. Maybe my personal zucchini scale is off, but if I used the 6 medium he calls for I would have ended up using almost 5 pounds worth. And while 12 slices of pancetta would probably be appropriate, 12 slices of regular American (streaky) bacon was going to be about a full pound for me, which was just too indulgent. What follows is still a lush recipe (it is cabonara after all, and if it’s not rich you’re not doing it right), with just the right balance of herbs and veg in a creamy sauce. I hope there are still zucchini and summer squash around you, they are on their way out in MA but I’ve still seen some around this past week. Fill a large pot with water and set to boil. Whisk the cream with the 2 eggs and shredded parmesan, season with salt and pepper, and set aside. Remove the leaves from the thyme sprigs. Slice the bacon into ¼ pieces and put in a very large pan over medium heat. While the bacon starts to render chop the squash into quarters lengthwise and then into ¼ slices. When the bacon is almost to your crispness liking, remove it from the pan with a slotted spoon (it will keep cooking a bit more). Drain all but a tablespoon of fat from the pan, reserving the rest in a bowl separate from the bacon. Turn the heat up to medium-high, and add enough sliced zucchini to cover the bottom of the pan, but don’t crowd them. Season with salt and pepper and allow the squash to cook for about 7 minutes total, allowing them to start browning. When that batch is done remove the squash from the pan into a bowl, return the pan to the heat, add another tablespoon of bacon fat, squash to fill the pan, salt, and pepper, and cook until they start to brown. Repeat until all the squash is cooked. When the pasta water boils, salt it liberally and then add the pasta. I start checking for doneness around 7 minutes by tasting for al dente. Reserve a ladle-full of the pasta cooking water and then drain. When the last batch of squash is finished, turn off the heat and add the rest of the cooked squash back to the pan along with the bacon and thyme leaves. Add the pasta to the pan as well and stir everything to combine. Add about a ¼ cup of the cooking liquid and your egg-cream-cheese mixture to the pan. Toss everything to coat in the sauce. It is really important to do this off the heat once the squash has cooked for a minute, so you don’t end up with scrambled egg sauce (though it’s really not the end of the world if you do, just not the prettiest sauce). If you like the sauce a little looser, add more of the reserved pasta water. Taste and add more salt and pepper if you like. 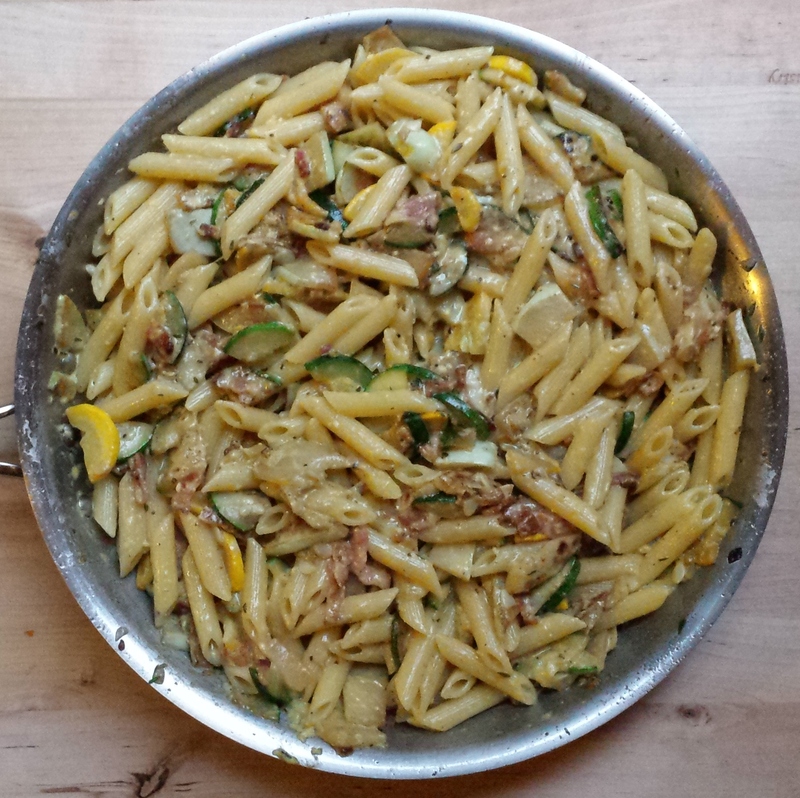 This entry was tagged carbonara, dinner, eggs, pasta, summer, summer squash, zucchini. Bookmark the permalink.